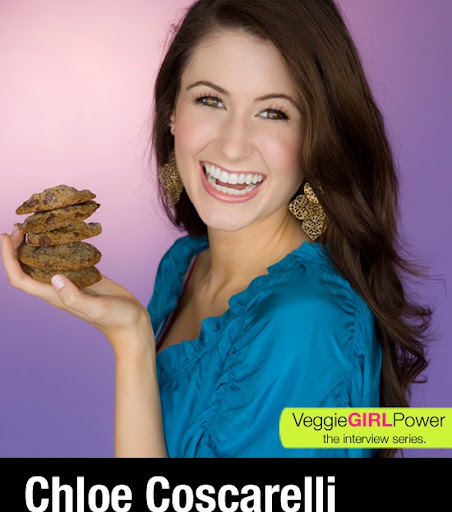 Chloe Coscarelli's Veggie Girl Power Interview! The charming and talented Chloe Coscarelli, aka "Chef Chloe" is in the spotlight for today's Veggie Girl Power interview! I am intrigued and energized by Chloe - a fresh, vegan face who has taken the culinary world by storm ever since her triumphant win on Food Network's Cupcake Wars reality show. Four words I'd use to describe Chloe: bubbly, sweet, inspiring and creative. Get to know Chloe!.. Chloe Wins One for the V-team! When I heard that Chloe, a vegan chef from Santa Monica California, won an episode of Cupcake Wars - I certainly wasn't surprised. While Chloe's competitors shook their heads in shock saying "How good could that vegan cupcake be??" - I was shaking my head thinking, "Well, it's about time! Way to go Chloe!" Since Chloe's triumphant win, she has certainly made the best of what most reality show chefs call their 15-minutes of fame. Well for Chef Chloe, fifteen minutes simply aren't enough! We all want more! More of Chloe's delicious vegan recipes and more of her cheerful personality that makes us simply feel good to be on the same team as Chloe: the vegan team! You may have seen Chloe featured on the cover of Woman's World, in the New York Times, in VegNews and more! Veggie Girl Power Interview: Chloe Coscarelli, "Chef Chloe"
Chloe: My breakfast of the champions is a smoothie granola parfait! I basically just throw whatever fruit I have on hand into my blender with some ground flaxseeds and almond milk then layer it with granola. It gives me all the energy I need to start my day and is reminiscent of ice cream! Chloe: Coconut milk is my secret to baking! It’s like nature’s substitute for heavy cream. Chloe: I gotta give this one to my mom! She never questioned my choice to go veg; in fact, she joined me. We’ve spent countless nights in the kitchen together veganizing her old family recipes and feasting on our newest vegan creations. She encouraged me to follow my dreams and insisted I go to culinary school after college. I don’t know where I would be without her support and inspiration. Chloe: I went vegan in high school and it was the best decision I’ve ever made! I have always been a huge animal-lover, and one day I realized that I could still eat delicious amazing food without hurting animals. I never feel heavy after eating vegan versions of ice cream sundaes or fettuccini alfredo. I LOVE to eat, so sticking to a vegan diet allows me to eat more food but still feel great! Chloe: It’s the simple pleasures that do it for me! Warm toast with thinly sliced avocado, a drizzle of olive oil and lemon juice with a dash of red pepper flakes and sea salt. Pure bliss! Chloe: The hardest part of going veg was learning to ask questions when ordering at a non-veg restaurant. At first I was shy about it, but I soon realized that so many items on any menu could be made vegan if I just asked them to hold the cheese or chicken etc. Chloe: It’s easy to get caught up in the intensity of food politics. Remember that at the end of the day, food should be joyful and bring people together. Chloe: Take everything as a complement! If someone is taking the time to criticize you, it means you are doing something significant. Chloe: Eating vegan should never be an “all or nothing” effort. Don’t worry about labeling your diet or long-term commitments. Instead, just have fun with vegan cooking when it’s available to you. Chloe: Lisa Bloom. She is FULL of vegan girl power. She inspires me with her “you can do anything” mindset, passion for helping others and contagious smile. Chloe: Always offer to bring an awesome veggie dish that you love. If all else fails, you can fill up on that! ..and yes, Chloe's cookbook is on the way! !